No, Starscream, YOU are supposed to hold THE FLAG, not the other way around. Humans try to hide in the subway tunnels, but Astrotrain is running his way through the rails. Other attacks are going on all over the US. San Francisco, Los Angeles, San Diego, and even Washington, DC are under assault. 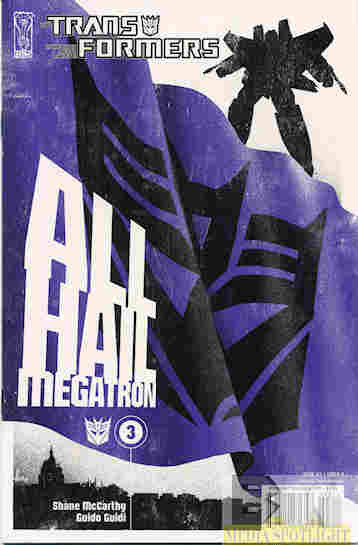 As the military tries to come up with any option and the humans struggle to survive, can anything stop the Decepticons? What they got right: Shocking as the deaths are it isn’t for the sake of shock, or that’s not how it comes off to me anyway. There’s an atmosphere of dread and hopelessness that is missing from, for example, Regeneration One in all of the devastation. There’s more of a strategy to it as well, and the writing does a good job at showing and telling without distracting exposition dumps. We also get a moment between Starscream and Megatron that explains why he keeps him around. What they got wrong: The traitor Megatron mentions is a complaint for a later time. Recommendation: I can’t understand the hate this series gets when it has more depth than any of the “destroy the Earth” stories Simon Furman have told, at least in US comics. Give this series a chance. Posted by ShadowWing Tronix on April 12, 2018 in Yesterday's Comics and tagged Decepticons, IDW Publishing, Megatron, Starscream. Forgot to add they actually called out the Air Force pilot for calling Ravage a dog instead of a jaguar.